While raspberry season is slowing down, there’s still plenty of berries out there to bake into a delicious cake, and a Manuka Honey Raspberry Bundt Cake is one of the best places to start! As something that can be served as a guilty-pleasure breakfast or a dessert with a scoop of vanilla ice cream, one gets to enjoy the unique taste of raspberries as well as the rich flavor of Manuka honey (rather than it being buried where no one can find it). It may take a lot of honey to ensure you can taste it, but it’s worth it to meld the cake together better as a whole. This cake offers about 12 servings total, and yet somehow it likely won’t feel like enough given the honey-dominant, floral taste that has the power forgo the voice cautioning against a second serving. It is worth it, so whip out the equipment and the apron and let’s get started! Preheat the oven to 350 degrees F. Spray a 10-inch tube pan or a 12-cup Bundt pan with cooking spray. Beat the butter and Manuka honey together in the bowl of a stand mixer at medium/low until the mixture is smooth and pale in color (almost white), which should take about 3 minutes. Beat in the vanilla and lemon zest. Add the eggs, one at a time, beating well after each addition. The mixture may look curdled, but don’t worry—it’ll smooth out. Beat in the flours, baking soda, and salt one cup at a time, alternating with the yogurt, until the batter is smooth and well blended. Gently fold in 1-1/2 cups of the raspberries using a spatula or a spoon. Place several of the remaining berries in the bottom of the prepared pan and spoon the batter over them. Spread the batter out evenly to fill the pan, then press the remaining raspberries into the top of the batter. Bake for 45–50 minutes or until the cake pulls away from the sides of the pan and a tester inserted in the center comes out clean. Let cool in the pan on a rack for 10 minutes, and then invert onto a serving platter. For the glaze: Beat the milk and Manuka honey together in a medium-sized bowl, and then add the confectioners’ sugar until you have a “spoonable” glaze. 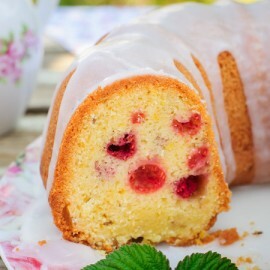 Drizzle over the cake, creating an even layer on top that attractively drips down the sides. Enjoy your cake!